Ebenezer Woodcock was born on 14th September 1824 in the Leicestershire village of Tur Langton, near Kibworth Harcourt. Ebenezer, the eldest child of Mary Perkins and William Woodcock, a stocking maker, was christened on 26th September 1824 in the Independent Chapel at Kibworth Harcourt, a village strongly associated with Non-Conformism*. The Christian name of 'Ebenezer' (which means "stone of help") was a name popular with non-conformists. Ebenezer Pannell, another Brighton photographer, was a Non-Conformist lay preacher. 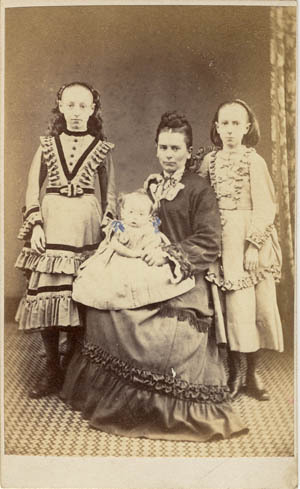 Ebenezer Woodcock had three sisters and two brothers - Mary Ann (born 1827), George (born 1829), Maria (born 1831), Caroline (born 1833) and James Woodcock (born 1835). Many inhabitants of Tur Langton, as was the case with a large number of Leicestershire villages in the 19th century, earned their living from the manufacture of worsted stockings. A villager would hire a stocking frame, a mechanical knitting machine, and would produce the worsted material in his own home. Operating the stocking frame required physical strength and so was usually operated by a man. The flat unshaped material would be taken off the frame and then seamed and fashioned into stockings by the women of the family. In the 1841 census, Ebenezer's father William Woodcock is described as a forty-five year old stocking maker. 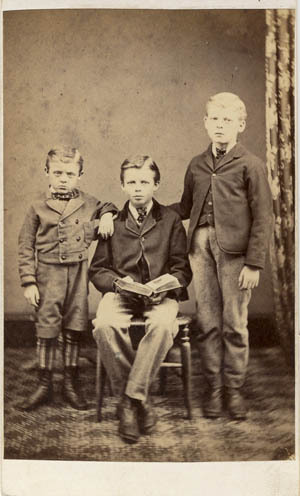 Ebenezer Woodcock, then aged 16, is also entered on the census return as a stocking maker. 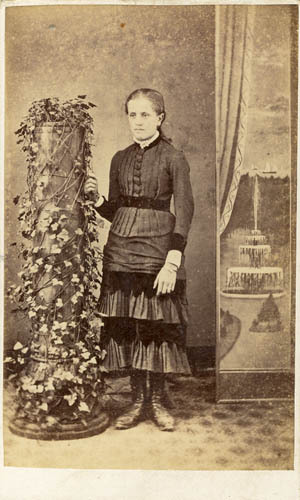 Ebenezer's mother, Mrs Mary Woodcock, and his 14 year old sister (Mary) Ann Woodcock were also engaged in the manufacture of woollen stockings in the family home. [LEFT] A hand-coloured print entitled "Stocking Maker" (c1805). 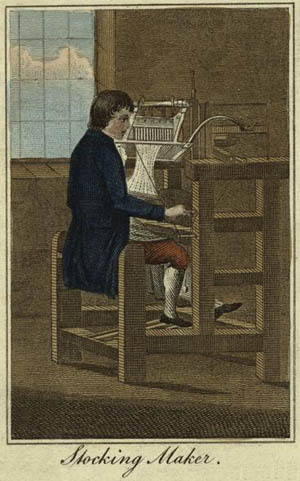 This contemporary print shows a young man operating a stocking frame at home. Many families in rural Leicestershire earned their living by making worsted stockings in their own home. By the middle of the 19th century, the introduction of the factory system and changes in fashion led to a decline in home-based stocking production. In 1845, a Royal Commission found that three-quarters of all "framework knitters" were either out of work or "seriously under employed and dependent on parish relief". It was probably the decline in domestic hosiery manufacture that forced Ebenezer Woodcock to leave the Leicestershire village of Tur Langton. With the emergence of power-driven factories in the 1840s and a decline in demand following changes in men's fashion, life became difficult for families who earned a living from making worsted stockings in their own home. Ebenezer Woodcock's two brothers were forced to find work locally as agricultural labourers and Ebenezer himself was obliged to leave his village for the city of Leicester to become a domestic servant. At the time of the 1851 census, twenty-six year old Ebenezer was employed as a "Footman" in the household of Alfred Paget, a wealthy solicitor who resided in West Street, Leicester. A decade later, Ebenezer Woodcock was working as a butler to William Charles Kerr (1799-1878), who lived at The Haie, a large manor house in Newnham, Gloucestershire. Ebenezer Woodcock married relatively late in life. In 1866, at the age of forty-one, Ebenezer married Mary Elizabeth Blackshaw (born 1828, Quorndon, Leics. 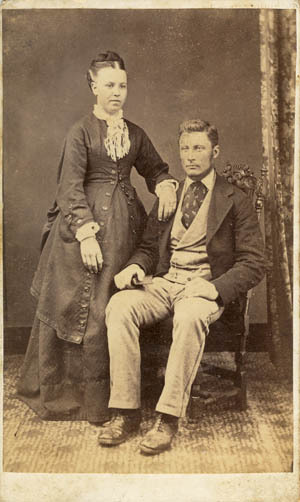 ), a former housemaid and the daughter of Sophia Collington and William Blackshaw, a butcher from Nailstone who had settled in Aston, near Birmingham in the 1860s. 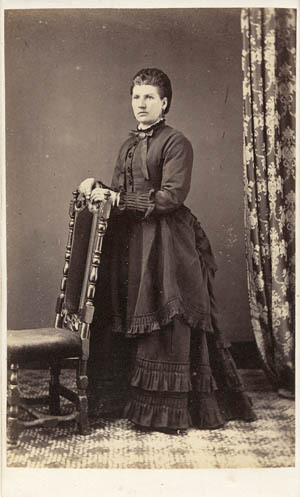 Mary Blackshaw's mother had died in Aston in 1863 and it was in the district of Aston, Warwickshire, that Mary, now in her late thirties, married Ebenezer Woodcock in 1866. [The marriage of Ebenezer Woodcock and Mary Elizabeth Blackshaw was registered in the district of Aston during the 2nd Quarter of 1866]. No children are recorded from this marriage. Shortly after their marriage, Ebenezer and Mary Woodcock took possession of a shop at 9 North Street Quadrant, at the bottom of Queens Road, Brighton. 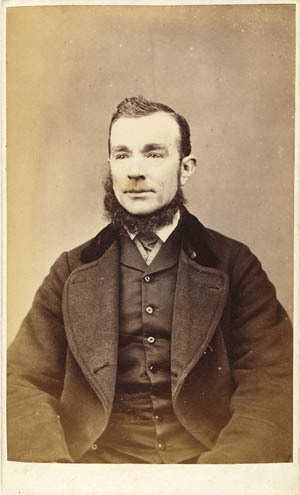 Ebenezer Woodcock set up a stationery business and converted part of the premises into a photographic portrait studio. 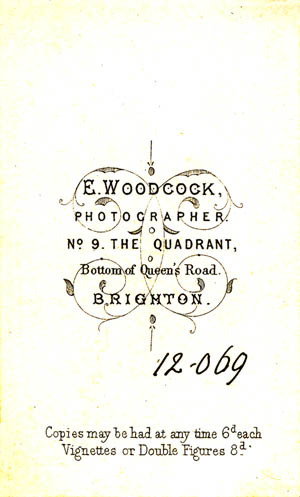 Ebenezer Woodcock is listed as a photographer at 9 North Street Quadrant, Brighton in the 1867 edition of Page's Directory of Brighton and Harrod & Co.'s Postal & Commercial Directory published in 1867. The 1871 census records Ebenezer and Mary Woodcock living at their business premises at 9 North Street Quadrant, Brighton. Ebenezer Woodcock is described on the census return as a "Photographer & Stationer", aged 46, and he gives his place of birth as Kibworth, Leicestershire. Also shown living with Ebenezer and his wife is Sophia Blackshaw (born 1829,Quorndon, Leics. 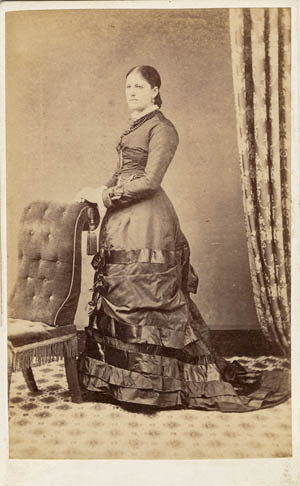 ), the unmarried sister of Mrs Mary Woodcock. Forty-one year old Sophia Blackshaw gives her occupation as "Toy Seller", but it is not known whether she sold her toys from her brother-in-law's shop. 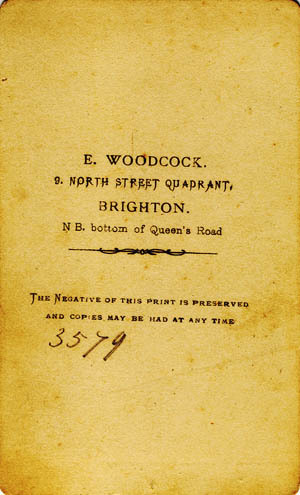 Ebenezer Woodcock was in business at 9 North Street Quadrant, Brighton for the next twenty years. 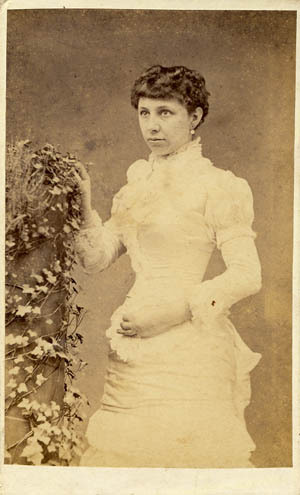 The majority of the Woodcock's portrait photographs were produced in the 1870s, but he was still listed as a photographer in a local trade directory of 1887. 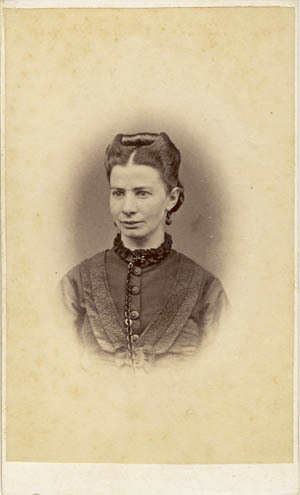 From around 1874, Ebenezer Woodcock began printing on the reverse of his cartes, his charges for making additional prints from the original photographic negative. Beneath the Negative Number, hand-written in ink, were the printed words "Copies may be had at any time 6d each. Vignettes or Double Figures 8d." 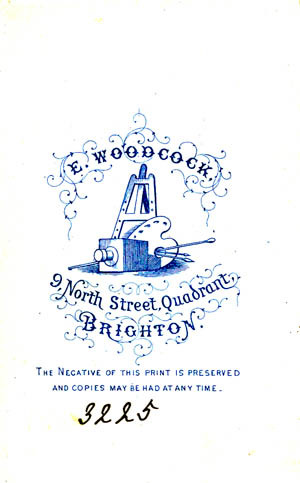 Woodcock's charges for additional copies were very reasonable compared to the prices charged other Brighton studios during this period. 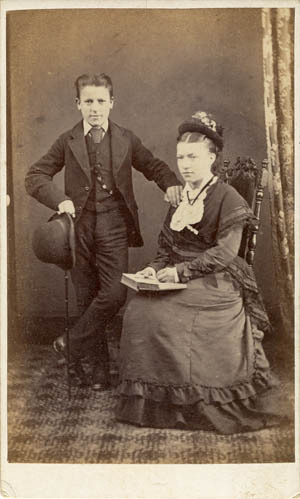 The firm of C. Hawkins of Preston Street, Brighton (operated by the founder's widow Mrs Eliza Hawkins), a successful but not particularly high-class studio, charged one shilling (12 pence) for a single copy of a carte-de-visite and six shillings for a dozen copies. In 1878, Henry Spink of 109 Western Road, Brighton & Goldstone Villas, Cliftonville (Hove) also charged one shilling for a single carte-de-visite portrait. 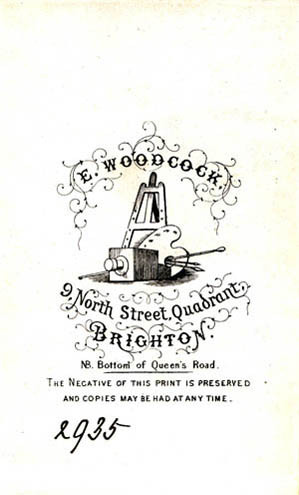 Ebenezer Woodcock remained in business at 9 North Street Quadrant, Brighton until about 1887. The photographic studio at 9 North Street Quadrant was acquired by Alfred Daniel Norman (born 1850, Clerkenwell, London - died 1908). The studio at 9 North Street Quadrant went under the name of A. D. Norman & Co. until about 1898. Ebenezer Woodcock returned to Leicester, where he died early in 1889, at the age of 64. After her husband's death, Mary Elizabeth Woodcock and her unmarried sister Sophia Blackshaw went to live with their brother James Blackshaw in Wolverhampton, where they both worked as laundresses. 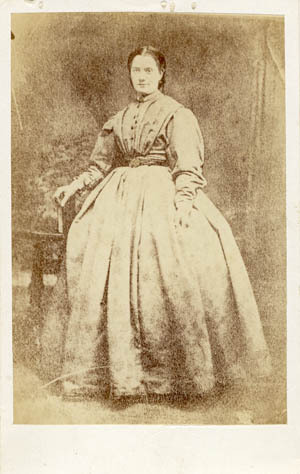 Mrs Mary Woodcock died in Wolverhampton during first quarter of 1896 at the age of sixty-eight. [ABOVE] An early trade plate of Ebenezer Woodcock, photographer of 9 North Street Quadrant, Brighton (c1870). 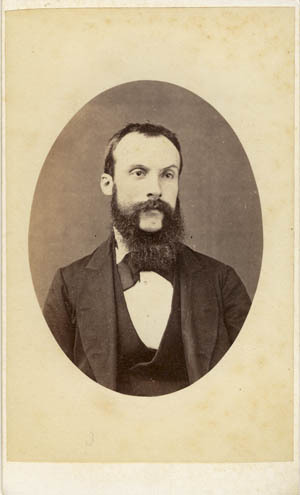 [ABOVE] A carte-de-visite portrait of a bearded man, photographed at Ebenezer Woodcock's studio at 9 North Street Quadrant, Brighton (c1872). *NON-CONFORMISM IN KIBWORTH HARCOURT. In the 1660s, Protestant Dissenters had held meetings in the village in the stables behind the Old Crown Inn and around 1689, Rev. John Jennings had established himself as a Dissenting Minister in Kibworth Harcourt. Rev. 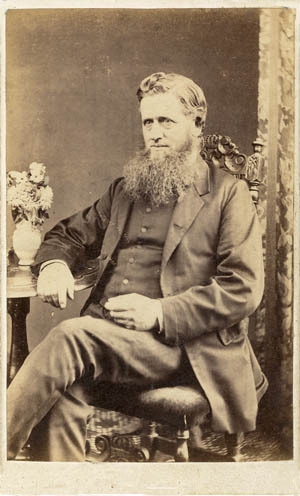 John Jennings junior, the Minister's son, had established an Academy in Kibworth Harcourt, where Non-Conformists could be instructed and prepared for ministry in the Independent Church. One of the students at the Academy was Philip Doddridge (1702-175), who in 1723 became the Minister of the Independent Chapel in Kibworth Harcourt and later became a leading Non-Conformist preacher and hymn writer. [ABOVE & LEFT] Two carte-de-visite views photographed by Ebenezer Woodcock of 9 North Street Quadrant, Brighton, both produced at the beginning of his photographic career in Brighton. 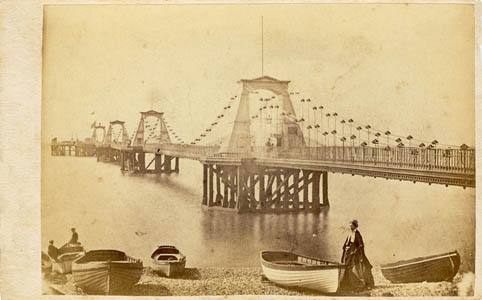 [ABOVE] A carte-de-visite view of Brighton's Chain Pier, photographed by Ebenezer Woodcock around 1870. 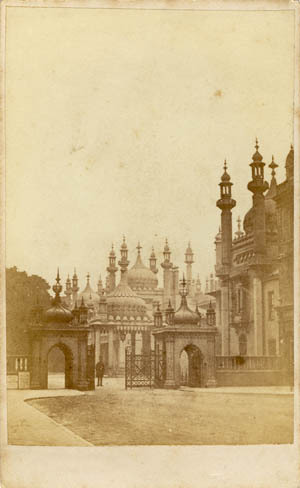 [LEFT] A carte-de-visite view of Brighton's Royal Pavilion, photographed by Ebenezer Woodcock around 1870. [ABOVE] Detail from a picture postcard of 1916 showing the parade of shops in Brighton's North Street Quadrant, where Ebenezer Woodcock earned his living as a photographer and stationer. Ebenezer Woodcock's business premises was at No. 9 North Street Quadrant, in the brown-coloured building to the right of the Clock Tower. Ebenezer Woodcock probably never saw the completed Clock Tower, as work on the structure was not started until January 1888. The Jubilee Clock Tower was built to commemorate Queen Victoria's Golden Jubilee of the previous year. 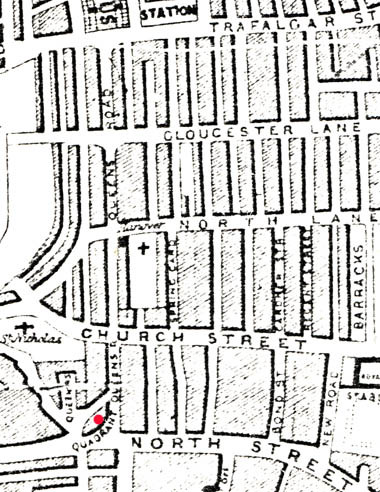 [ABOVE] An 1865 map of Brighton showing the position of the North Street Quadrant at the bottom of Queens Road. Brighton's Railway Station was at the top end of Queens Road. The location of Ebenezer Woodcock's studio at No. 9 North Street Quadrant is marked with a red dot. 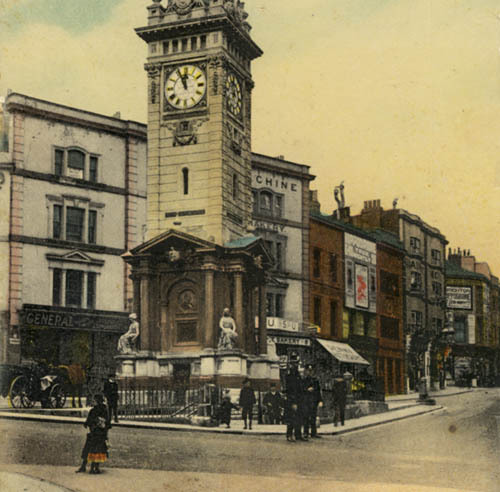 Brighton's North Street Quadrant was the site of several photographic studios throughout the Victorian period. 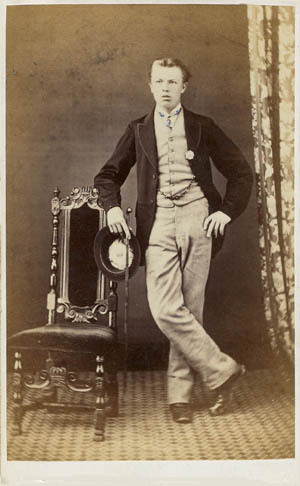 James Richard Bates (born 1827, Dallington, Sussex), a fruiterer & seedsman, established a photographic portrait studio at No. 10 North Street Quadrant around 1857. Ebenezer Woodcock set up his photography business at No. 9 North Street Quadrant around 1866. 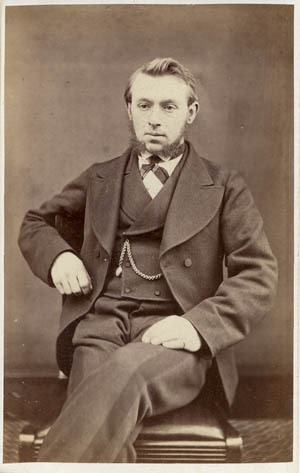 Joseph Parkin Mayall (born c1839, Linthwaite, West Yorkshire), a son of the famous photographer John Jabez Edwin Mayall, ran a studio at No. 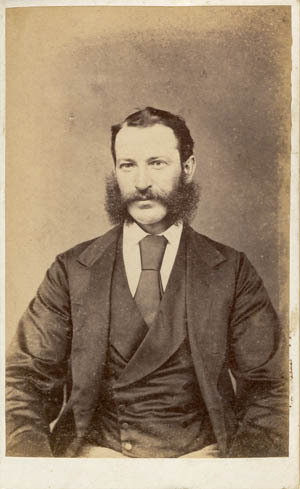 6 North Street Quadrant for a few years after he returned from Australia in 1877. Joe Mayall's studio at 6 North Street Quadrant was taken over by Henry Barrett (born c1842, London) who produced American Gem "tintype" portraits at No. 6 in the early 1880s. 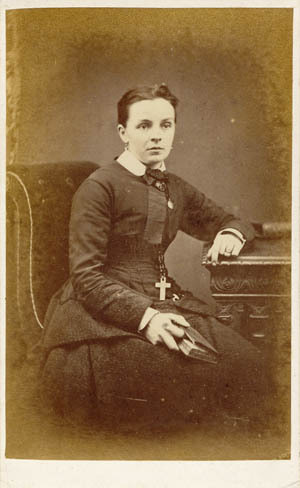 [ABOVE] A carte-de-visite portrait of a young girl identified as "Ethel Meta", photographed by Ebenezer Woodcock of 9 North Street Quadrant, Brighton (c1874). Negative No.9166. 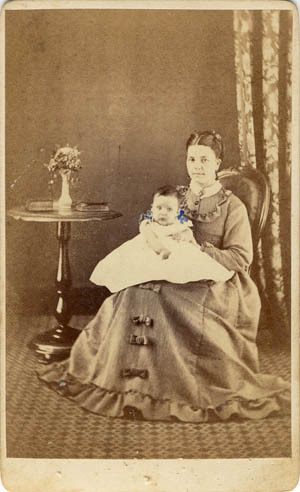 The subject is probably Ethel Meta Stoner who was born in Brighton towards the end of 1873. 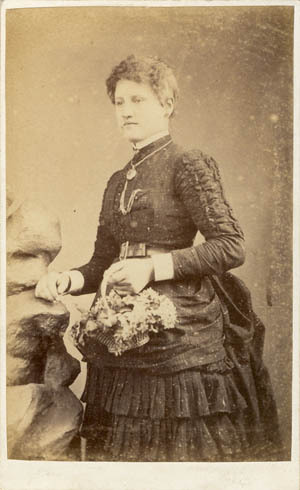 Ethel Meta Stoner was the daughter of Harriett and John Nathan Stoner, a dentist who lived at 110 Queens Road, Brighton. 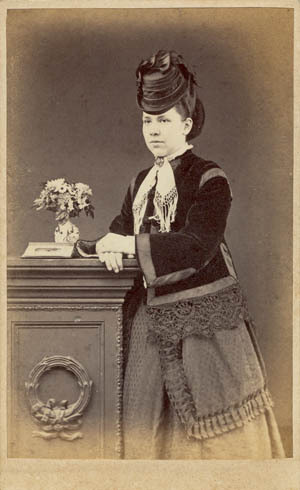 Ethel Meta Stoner died in Brighton in 1900, aged 26. The trade plate design on the reverse of the carte (SEE BELOW) was used between 1871 and 1874. 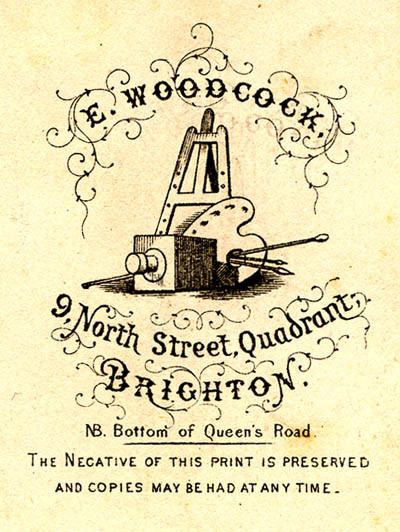 Ebenezer Woodcock was in business at 9 North Street Quadrant, Brighton for twenty years, from around 1867 until 1887. On average, a photographer in the 1870s produced between 800 and 2000 negatives a year, depending on the popularity and reputation of the studio. 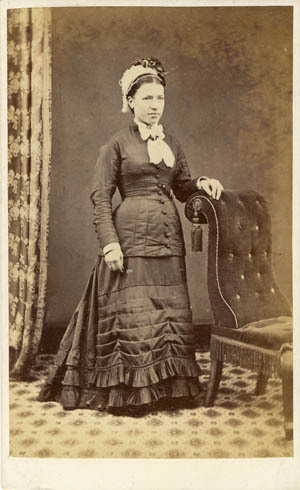 None of the carte-de-visite photographs on this page are inscribed with a date and so all dates have been estimated on the basis of fashion details, style of portrait, trade plate design and negative numbers. The table below provides only a rough guide to dating and the actual date might be a few years either side of the estimated date under "Approximate Date Range". 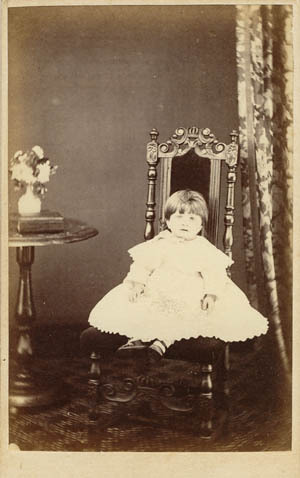 The one example with an identified sitter, the toddler Ethel Meta pictured on the left, supports the date range given in the table. 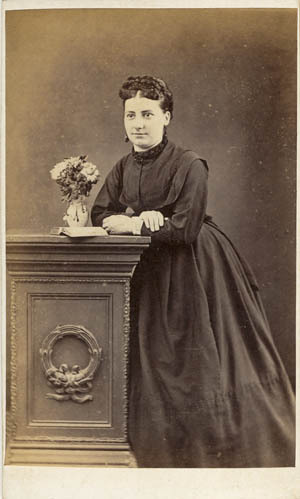 [ABOVE] A full-length portrait of a woman standing by a table, a copy photograph of an earlier carte-de-visite. 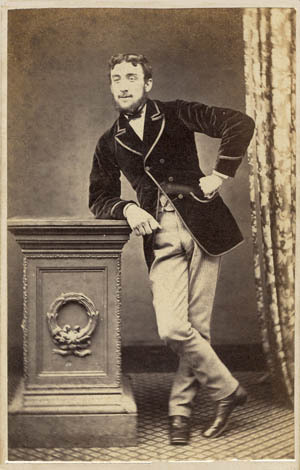 The original photograph was taken around 1865, but copied by Ebenezer Woodcock at his North Street Quadrant studio about 5 years later (c1870). Negative No.2,123. 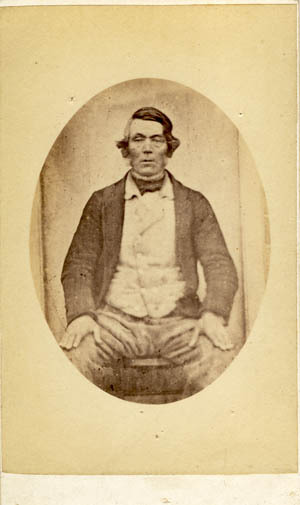 [ABOVE] A copy photograph of an early portrait of a seated man. 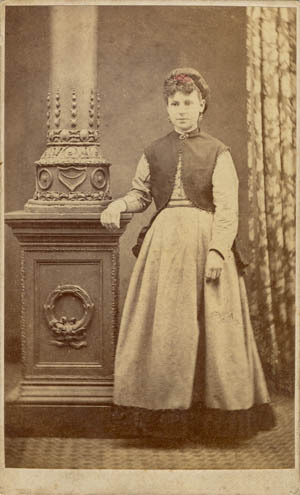 The original portrait , possibly a daguerreotype, was probably made in the mid or late 1850s, but Ebenezer Woodcock made this copy in carte-de-visite format around 1873. Negative No.7221. 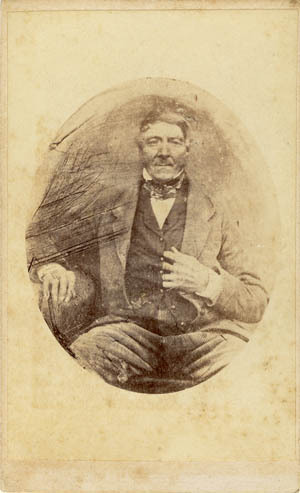 [ABOVE] A copy photograph of an early portrait of a seated man. 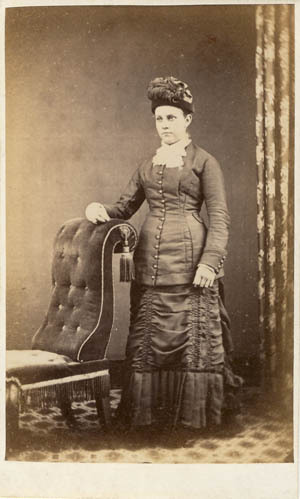 The original portrait , possibly a collodion positive on glass, was probably made in the 1850s. 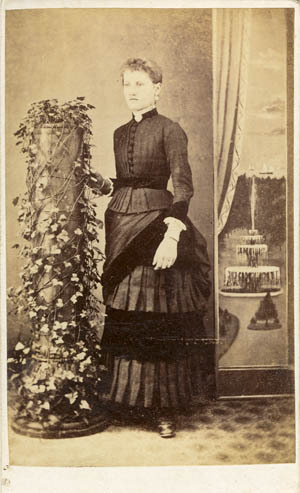 Ebenezer Woodcock made this copy in carte-de-visite format around 1876. Negative No.11,377.